Fluffernutter...have you heard this term before? If not, go check any college dining hall and I am sure you will find a few students snacking on this sweet treat. A fluffernutter, for those not familiar, is a sandwich made of marshmallow fluff and peanut butter. It's simple to make and requires very few ingredients, thus it's a college staple. Working full time and taking graduate courses part time has made me miss my college days. 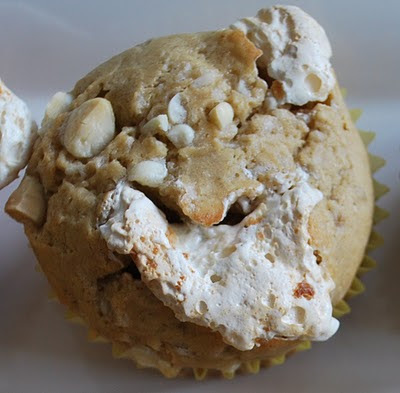 Peanut butter and marshmallow fluff is such a great combination, so when I came across this recipe I just knew I had to try it. I actually misread the recipe at first and dropped 1 Tbsp. of fluff into the muffin cups instead of 1 tsp. Even though my proportions were a bit off, I liked the way the fluff exploded through the top of the muffin; so that's why I wrote below to use a heaping tsp. when you drop your fluff. The next time I make this recipe I think I will bump up the white chocolate chips to 6 oz. and then add 4 oz. to the actual batter and 2 oz. on top. Preheat the oven to 350 degrees F. Line a 12-cup regular muffin pan and a 12-cup mini muffin pan with liners. In a large bowl, using a mixer on medium speed, beat together the mashed bananas, peanut butter, brown sugar, and oil until creamy - about 1-2 minutes. Beat in the vanilla and egg until combined. Reduce the mixer speed to low and gradually beat in the flour mixture, alternating with the milk. Divide 1/3 of the batter into the muffin cup bottoms. Place a heaping teaspoon of marshmallow fluff into each center and then take 2 oz. of the white chocolate and evenly distribute into the centers. Top with the remaining muffin batter and then sprinkle the remaining 2 oz. of white chocolate on top. Bake 20-22 minutes or until light golden brown and risen. Cool 5 minutes before transferring to wire racks to cool. I made 12 regular sized muffins and 12 mini muffins with this recipe.